A dilapidated former cinema in Bradford which until recently faced demolition could be taken over by the local community, its supporters have said. 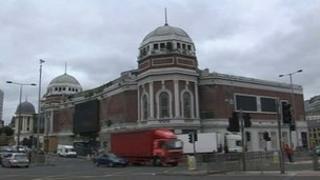 Members of the Bradford One group, which has just been launched, said the former Odeon could become a venue for music and other cultural activities. The redevelopment could cost about £10m, said Bradford One. A feasibility study and business plan would be drawn up following a public consultation, the group said. The Odeon originally opened as the New Victoria cinema and theatre in 1930 and closed in 2000, since when it has remained empty. Plans to demolish the former Odeon were scrapped in September after the Homes and Communities Agency (HCA), which owns the building, terminated an agreement with developers Langtree Artisan. Langtree had wanted to develop the site to create offices and apartments, but the HCA said the firm had failed to comply with the terms of the development. Bradford Council has since called for new ideas to regenerate the building. If given the go-ahead, it would be transformed into a cultural venue incorporating an auditorium, restaurants, cafes and shops, said Bradford One. Image caption Griff Rhys Jones said the Odeon campaign was "a sterling example to all communities"
However, supporters of the redevelopment still faced a "daunting task", said Gideon Seymour from Bradford One. "We need to be realistic, we need to start our fund-raising effort and we need to talk to people and get them enthused so we can create momentum," said Mr Seymour. Any plans for the building would be rooted in community ownership, with the former Odeon as "an asset for the whole community", he said. Attending the launch of Bradford One, comedian and actor Griff Rhys Jones, the president of Civic Voice, which represents about 300 civic societies across Britain, said the long-running campaign to save the building was "a sterling example to all communities".